Northwest quarterback Carter Terry has had a football in his hands for as long as he can remember. For Carter and his dad, NW offensive coordinator Ken, football has always been a family affair. NORTH ROAD, GRAND ISLAND — It’s one minute until 6:00 on Thursday night and Grand Island Northwest is on the downhill side of their fourth football practice of the season. It’s 90 degrees. They have been at it since 4:00. But Northwest needs to go fast for the next 20 minutes. Like really fast. The words come from Ken Terry. Northwest offensive coordinator and father of starting quarterback Carter. The Vikings sprint down the field in an 11-on-11 session with a camera high above the field, Ken Terry shouting out the formations and nothing else. Each play, well, that’s on Carter. By 6:02, the Vikings are in the end zone and going the other way. Carter and his dad will watch the film later. 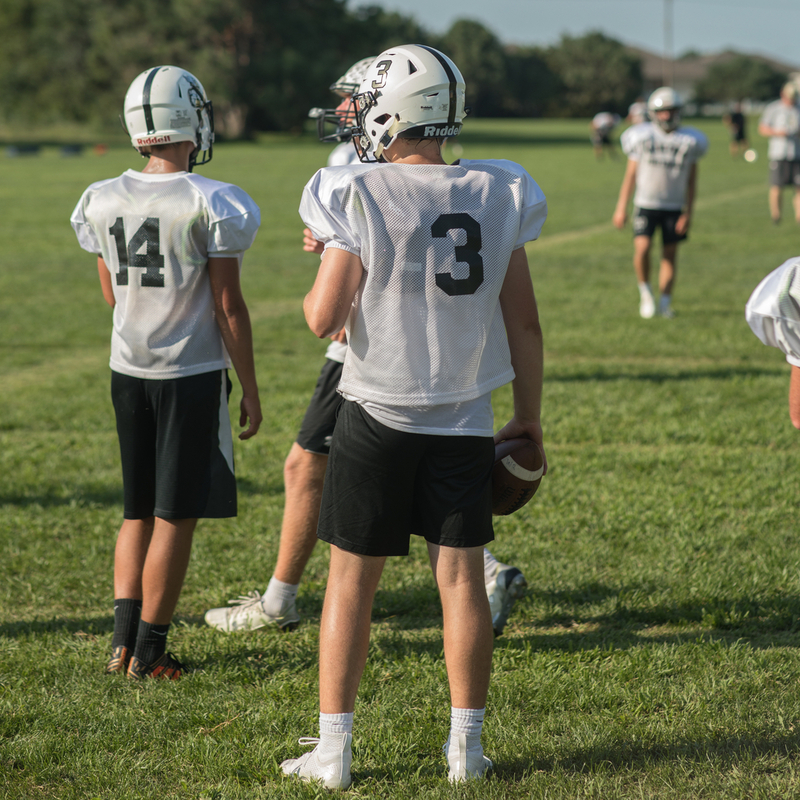 To know the story of one of the best quarterbacks in Class B — in the state, maybe — you have to take a drive down the road to Cozad. Ken Terry was a quarterback. His dad, Jim, was the freshman coach; the only Terry sibling who left Denver. After school at Northern Colorado, he had a choice: Manhattan, Kansas or Cozad. He picked Cozad and never left. By the time Ken was a senior, the Haymakers were building something. They advanced to the playoffs for the first time in school history in 1988, even though the quarterback’s senior season was cut short by injury. Brendan Holbein and Chris Dishman — those national champion Huskers — were freshman that fall. When they were seniors they won Class B.
Ken went and quarterbacked Nebraska-Kearney, then came back to help. Young Carter found heroes like Eric Love and Jared Crick when the ‘Makers made playoff runs in 2006 and 2007. His first football memories are those seasons, those practices. Nine days before fourth grade, the family moved to Grand Island. Carter took things in stride; he played quarterback in 5th and 6th Grade youth league. But, in middle school he played in the line — guard and tackle — and a little bit of tight end. “We ran kind of a weird offense,” he admits all these years later. Now, the kids watch Carter. Northwest coach Kevin Stein had a hunch he had a good one in 2015 when Carter Terry was a freshman and he apprenticed under record-setter Christian Ellsworth. The Vikings hosted a playoff game for the first time in a generation that year after finishing the regular season 7-2. They lost a low scoring affair to Lincoln Pius in a cold downpour in the opening round. A season later, Terry was thrown to the fire as a sophomore. The Vikings finished 5-5 after a first round playoff loss to eventual semifinalist McCook and the young quarterback threw for nearly 230 yards per game and 23 touchdowns. The Vikings were 4-2 on October 13th last year. That Friday, the wheels almost fell off. Rival Aurora played a perfect first half: they took a 14-7 advantage early in the second quarter, then recovered an onside kick and scored for 21-7 lead. The next Aurora kick bounced off a Northwest up man. At halftime it was 28-7. Terry could just watch. “I’ll never forget sitting there and watching that,” Carter says. At halftime, Carter Terry talked to his teammates. Assured them he knew they could win. Then he did something you wouldn’t expect from a high school player. He walked into the coaches room and grabbed a marker. On their first drive, the Vikings drove to the Aurora 1, but didn’t score. No matter. It set up a pick six and then Terry went. He led three straight scoring drives for a 35-28 lead and the Vikings held off a late two-point conversion attempt for a season-changing 35-34 win. The next week, the Vikings lost 31-14 to eventual state champion York and earned the 9-seed in the Class B playoffs and a rematch with Columbus, who had beat them 48-30 on September 8th. Carter and dad were in a zone two weeks after the Aurora first half fiasco. They picked apart Columbus in the first half for a 24-7 lead, then held on for a 48-41 win. The school’s first playoff win since 1987. Terry finished 14-for-28 for 236 yards and a touchdown and ran for three more scores, while rushing for 65 yards on 10 carries. “He was a step ahead,” Stein said. “He and his dad were a step ahead of anything Columbus was doing in the first half. They masterminded everything and were on the same page. Stein knows what this final run will be like for the Terry’s. He was a quarterback for his dad, too. “Being a coach’s son is so hard because of the expectations,” Stein said. “You have to be as good as dad expects. And, sometimes when he says ‘good job’ or ‘I love you’ it’s because of a play you made. And at Northwest, Stein and his staff knew they had a special quarterback well before Carter Terry was leading second half comebacks and playoff wins. Football was something Carter just had when he was born. “I just see it in my mind, I guess,” he said. And, don’t think it’s coming off as cocky or arrogant. He just loves football. He wants his team to succeed more than himself. Ken Terry has seen it at the dinner table. 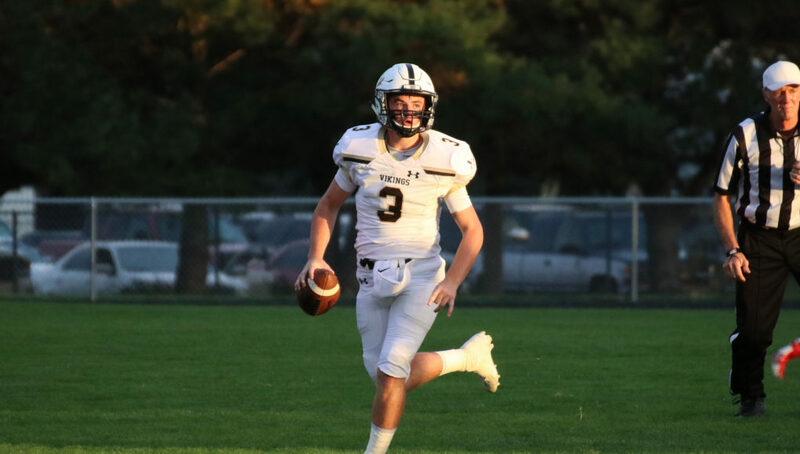 Nearly every Class B passing record is in Carter Terry’s sight this fall, his junior season was already the most yards in class history and he’s just 300 yards short of the career mark. But on a hot summer night after an early practice, you get a sense of his calm demeanor and presence in the huddle. Asked what he’s learned since he started and he quickly goes to talking about his teammates: past and present. He wears a black t-shirt with his number 3 over his heart. He wants to play college football, but just holds one offer from Chadron State. That’s all. He knows why. “They don’t see a guy who is 6-2,” he says. Maybe this season, they’ll watch a little more than what it says on his physical. His leadership. His passion for football. His ability to see something, then draw it on a whiteboard. That stuff you can’t coach. Ken Terry knows one thing as the last ride gets ready to take off for the season. “I know we wouldn’t trade him for anyone,” he says. As a quarterback. Or a son.